Lhasa Limited has provided the work by Patrik Rydberg et al. SmartCyp and WhichCyp via KNIME nodes. The first output gives the summary output showing a highlighted structure with rankings (PNG) and a CDK cell with atom highlights appended to the input table. 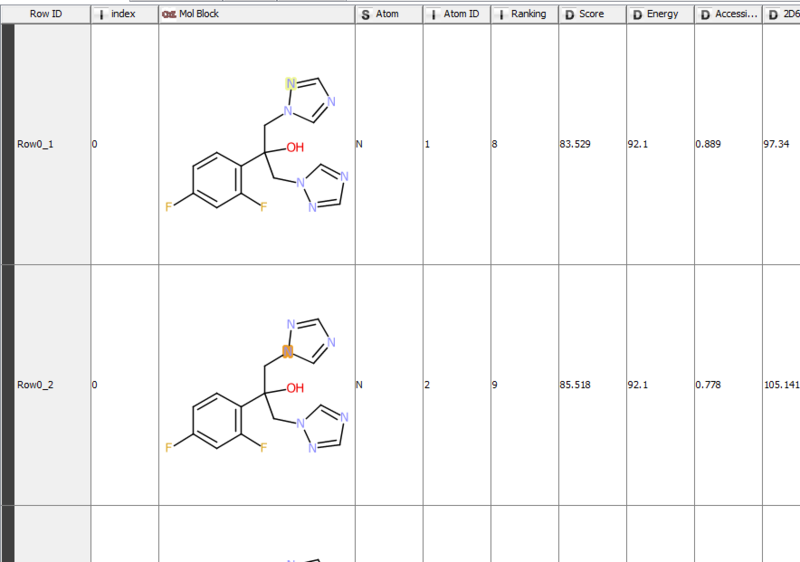 The second output table details the values for each atom on each input molecule (multiple rows per input row). These nodes have been written for KNIME version 3. Some Java 8 functionality has been used so the nodes are not compatible with KNIME 2.x. - No updgrade to CDK 1.5.x as this has a signficiant impact of the results generated. The SASA (Solvernt Accessible Surface Area) algorithm produces different output (appears to rely on a side effect of the ordering of the atom types which changes in CDK 1.5) and the SMARTS matching differs resulting in a change in some energy assignments. - Run jarjar links on the smartcyp.jar and whichcyp.jar to rename the packages from org.openscience. * to org.openscience.old. * to avoid loading the wrong version of the CDK classes. If this is not performed CDK 1.5.x is loaded in some cases and CDK 1.4.x is others. Efforts have been taken to ensure that the results reproduce those generated by SMARTCyp 2.4.2 and WhichCyp 1.2. During this a bug was found in SMARTCyp which causes a miscalucation of the SASA value in symetric bicyclic motif containing structures. The issue remains in the node but this causes a small number of structures to generate a different output in terms of SASA value (rank remains the same). The same issue happened when running SMARTCyp outside of KNIME, equivelent atoms should have the SAME SASA value however in bicyclic systems this is sometimes calculated incorrectly, the atom with the incorrect calculation may differ from run to run. A comparison of 6850 structures from drugbank were processed through SMARTCyp 2.4.2 and then through the node. The differing results change run to run; around 0.36% of the structures have a different output from SMARTCyp. The same issue is found when running the SMARTCyp jar multiple times and comparing output. The values generated here are reproducable to the same extent as the KNIME node. Here, one of the four symmetry-related nitrogen atoms show a SASA of 9.122 where the others show 6.976. The specific nitrogen atom with this 9.122 value may differ between runs of SMARTCyp. Of the structures that don't match all contain a cage motif and all have the same Energy but different SASA (as the atom associated to the different value changes). As the SASA value is used in the score calculation this also changes. The results have been deemed reproducable to the level that SMARTCyp itself is when running the KNIME node. A subset of the SMARTCyp test compounds have been used (structures < 20 bonds), all 3847 structures produce the same results in the node as in the application. SmartCyp and WhichCyp are provided under the GNU LESSER GENERAL PUBLIC LICENSE. The KNIME nodes are provided under the GNU GENERAL PUBLIC LICENSE.